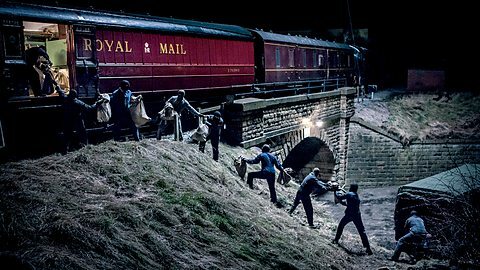 One of the most infamous robberies of all time, 1963’s Great Train Robbery involved the hijack of a London-bound train, and the theft of millions of pounds. Late on Thursday 8 August 1963, a Travelling Post Office train left Glasgow for Euston. On board, staff sorted the mail and parcels prior to its arrival in London. The second carriage from the front of the train was a High Value Package carriage, where registered mail was sorted. Much of this consisted of cash. Usually the value of these items would have been in the region of £300,000 but, because there had been a Bank Holiday weekend in Scotland the total on the day of the robbery was £2.3 million (about £30 million today). 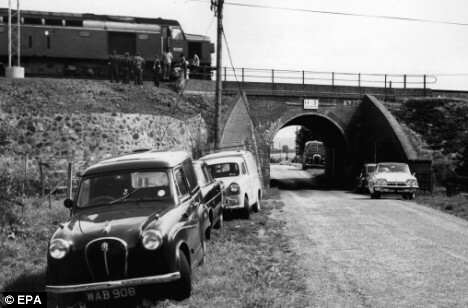 The train passed Leighton Buzzard at about 3am on 8 August 1963, and moments later the driver, Jack Mills saw a red signal ahead at a place called Sears Crossing. The signal was false. A glove had been stuffed onto the proper signal and the red light was activated by attaching it to a six volt battery. When Mills stopped, his co-driver David Whitby climbed out of the diesel engine to ring the signalman to ascertain the problem. He discovered that the cables from the line-side phone had been cut and as he turned to return to his train he was attacked and thrown down the steep railway embankment. Meanwhile, a masked man climbed into the train cab and coshed the driver around the head rendering him unconscious. Meanwhile, other robbers uncoupled most of the carriages, leaving on the engine and the first two carriages containing the high-value property. The steep embankments at Sears crossing were unpractical for removing the loot from the train but the gang had planned to drive the train a mile further to Bridego Bridge. Here, Land Rovers were waiting to transport the cash to a nearby hideout. Soon the well-planned heist encountered a problem. One of the gang had spent months befriending railway staff on the pretence of being a railway enthusiast. He had been allowed rides in the cabs of trains and had even been permitted to drive a few trains. His part in the robbery was to drive the train to the rendezvous point but as he climbed into the cab of the train he realised that this huge diesel train was far more complicated than the local trains he had previously travelled in. One of the gang, Ronnie Biggs, had to rouse the driver to continue the journey. In the front two carriages, frightened Post Office staff were pushed to one end by some of the fifteen strong gang – but, in the remaining ten carriages left at Sears Crossing, staff did not even realise anything had happened. At Bridego Bridge a human chain of robbers removed 120 sacks containing two-and-a-half-tons of money. The robbery was well organised and swift. Before leaving, one of the gang ordered Post Office staff to stay still for 30 minutes before contacting the police. This gave the investigators an important clue, they suspected that the gang had a hideout within a 30 minute drive of the scene. This was indeed the case. An old farmhouse in Oakley Buckinghamshire, Letherslade Farm, had been rented and during the next few days the jubilant gang shared out the cash. They even played Monopoly using real money. A huge police investigation was launched, run by the Flying Squad at Scotland Yard and senior detectives from the Buckinghamshire Police. The officer in overall command was Detective Chief Superintendent Jack Slipper. British Transport Police had a small role to play in the investigation, mainly conducting enquiries, obtaining lists of staff and suspects. Back at the farm, the gang were becoming spooked by low flying RAF aircraft who were actually on training runs and nothing to do with the manhunt that had now been established. They split the money which was mainly in used £1 and £5 notes (Biggs was to receive £147,000) and left the scene immediately rather than ‘lying low’ for several weeks as they had planned. A nearby resident became suspicious of the comings and goings at the farm and advised the police. PC John Wooley responded to the report and found large amounts of abandoned food and provisions. Sleeping bags and bedding had been left in upstairs rooms and in the cellar, bank note wrappers, post office sacks and registered mail packages. A thorough examination found several fingerprints including some on the Monopoly board and others on a ketchup bottle. These fingerprints and other enquiries led to the offenders and one by one they were arrested. BTP headquarters at Park Royal in north London was regularly updated of the progress of the investigation and the Chief Constable was sent supplementary crime reports giving the names and details of those involved. They all eventually appeared in court. The mastermind of the operation, Bruce Reynolds took five years to track down but received ten years imprisonment. Ronnie Biggs received 30 years but escaped from Wandsworth prison in a furniture van only 15 months later. His flight to Brazil (via Spain and Australia) and subsequent return to the UK in May 2001 have been well documented. The gang received a total of 307 years imprisonment. Despite the huge amount of money stolen none of the thieves were able to live happily on their ill-gotten gains. Buster Edwards ended up running a flower stall at Waterloo station. He received a lot of publicity in 1988 when Phil Collins played him in the film Buster. He took his own life in the late 1990s. James Hussey and Thomas Wisbey were convicted in 1989 for trafficking drugs, while Charles Wilson was shot and killed in Spain. It must be said that the Great Train Robbery was brilliantly planned and executed. Apart from the attack on the train driver it was non-violent and no firearms were used. The raiders managed to steal much more money than they had planned and perhaps it was the greed in sharing all the money out which led to them being careless and leaving so many fingerprints behind, sealing their own fate. This entry was posted in Outlaws / Gangsters/ Robbers, The great train robbery. Bookmark the permalink.